I love fashion, clothes and shopping and although I spend lots of time reading style blogs, checking out instagram posts from my favourite fashion bloggers and watching how stylish people I see out and about dress, I don’t often blog about it. Mainly because I don’t get round to it, and also maybe because I’m not that comfortable posing for photos in front of the camera! I’m always putting my dream outfits together in my head but rarely do I go shopping for an entire look in one go. I usually just buy one or two pieces at a time that I love (note love not just like, that’s the key to feeling good, only buying clothes you love and feel good in!). When I was asked to take part in a style challenge by Monks Cross Shopping Park in York of course I said yes straight away. The chance to shop for a look for work? Yes please! I couldn’t wait to get started. Monks Cross is about an hour away from my house but not much further than if I were to go into Leeds to shop, which would take me about 45 minutes. It’s also much easier to park than in a city centre and there’s a great choice of shops – including many of my favourites like Topshop, Warehouse, New Look and Oasis at Outfit as well as a Primark, Monsoon and Accessorize, H&M, River Island and Debenhams. Loads of options without having to walk a long way between shops! There is also free parking for up to four hours so plenty of time for a look around. I was challenged to put a look together for £250 and decided to go for a perfect weekend away wardrobe. 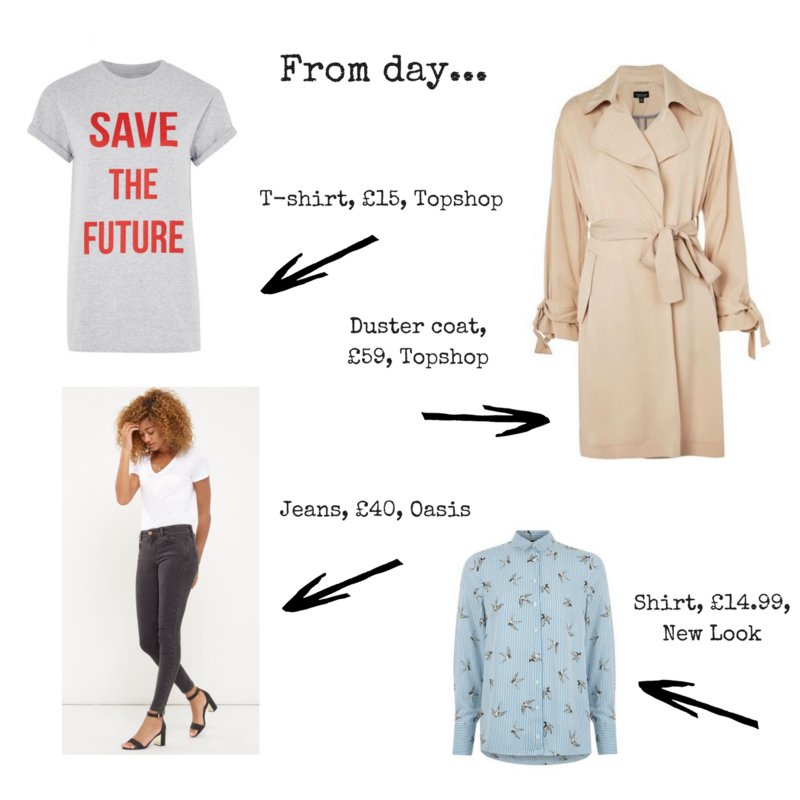 Some casual looks for day and a dressier option for evenings, including shoes and accessories, all shopped for in a day on one site. 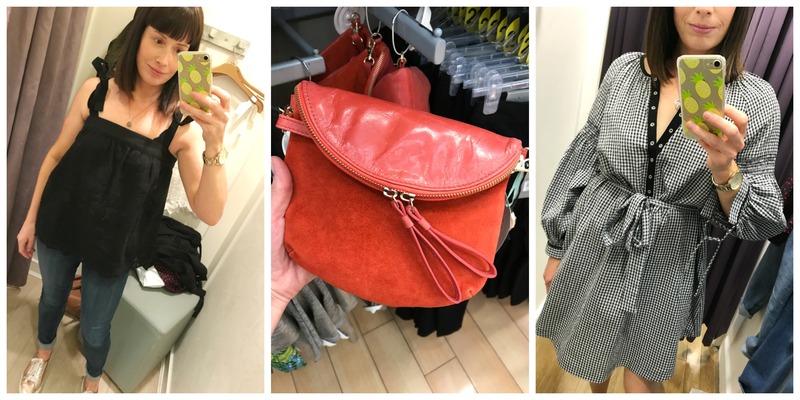 Finding clothes that I liked was easy – it was keeping track of how much of the budget I’d spent that was the tricky part. So much so that I ended up going slightly over the top and a few things may have to be returned. I feel quite pleased though that I managed to get a capsule weekend wardrobe for under budget – spending a total of £247.99 on my haul. 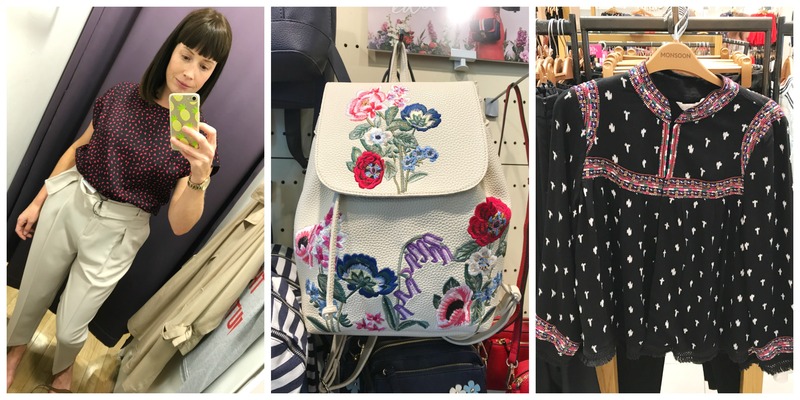 The hardest part was taking photographs of the things I liked and tried on – I have inevitably ended up with loads of changing room selfies plus a few taken by an extremely helpful assistant in Outfit and the outdoor outfit shots snapped by friends. 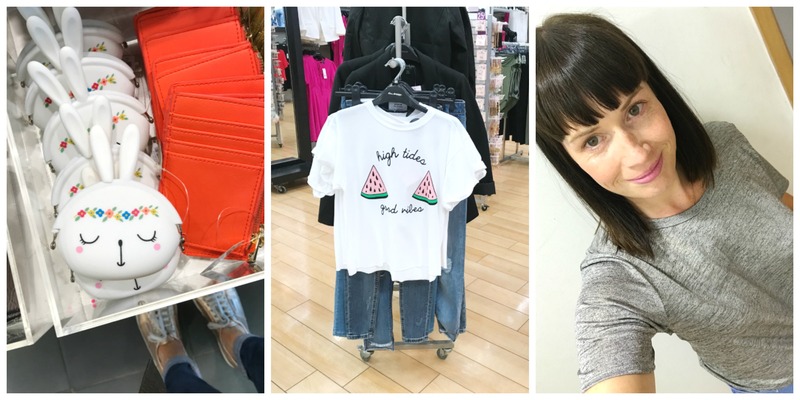 The shirt – pictured above in the collage left – was the first thing I bought and probably the first thing I saw when I went into New Look. They have loads of good shirts in at the moment, plenty of on-trend gingham and denim too and their prices are very reasonable. I couldn’t believe this was only £14.99 as I think it looks way more expensive. I’d wear it with jeans for daytime or dress it up with a black pleated skirt for work or evening. It’d also look pretty cool tucked into shorts if the weather perks up! Next up I went into one of my favourite shops, Topshop. 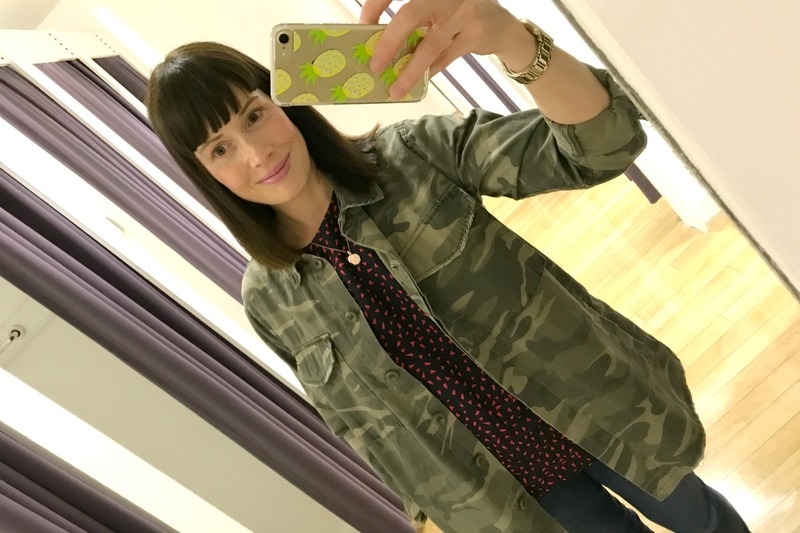 I may be 40 but I’m not too old for a bit (or a lot) of Topshop, I love their styles and you always get something a bit edgier in there, it’s especially good for denim, dresses, accessories and jackets. That’s pretty much everything I wear actually! I ended up blowing a lot of my budget in here but that’s mainly because I fell for two jackets – one camo shirt jacket or “shaket” as they call it, and a soft trench “duster” coat for dressier days. 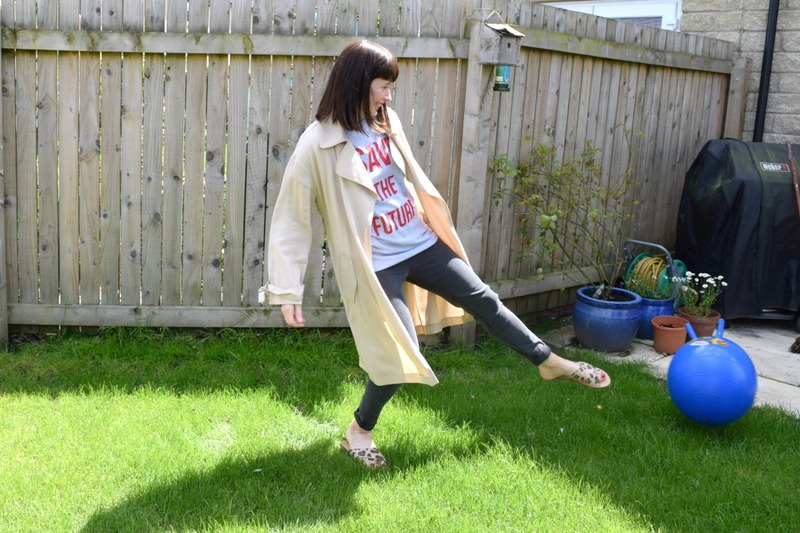 The duster coat I wasn’t sure of at first – I love this style on other people but wasn’t sure if I was too short to carry it off! However after meeting up with my friend for lunch she gave it the thumbs up so I decided to go back and buy it. I think I’ll get a lot of wear out of both jackets and if I were taking them on a weekend away I’d like to have two options so these would work perfectly. 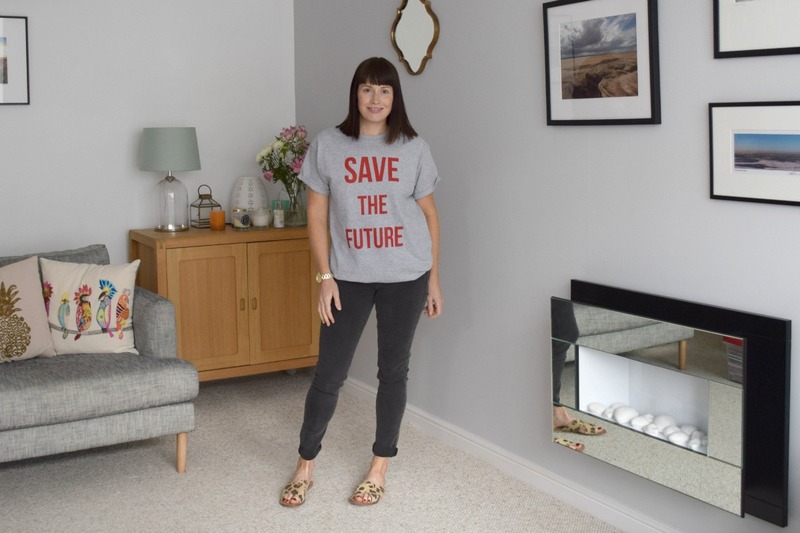 My next buy was this Save The Future t-shirt at £15. 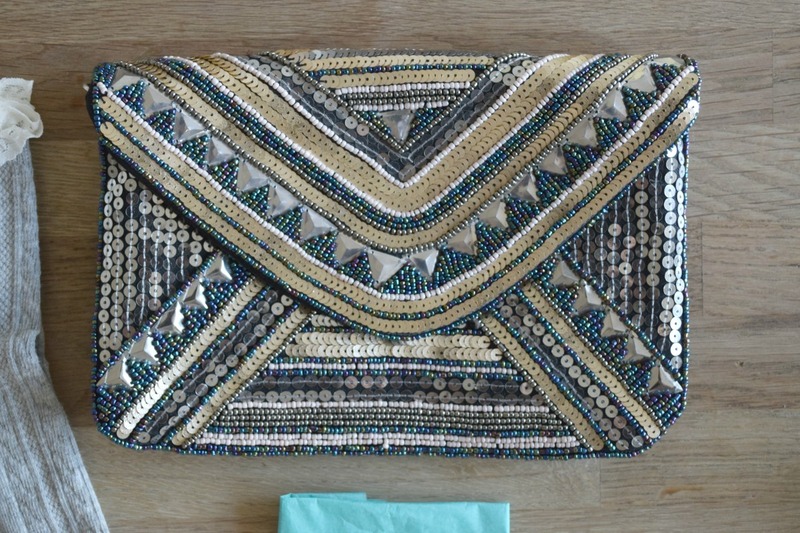 I’d seen it on one of my fave bloggers, Emily at Brick Dust and Glitter, and absolutely love it. I’m wearing it in the picture with the jeans I bought from Oasis, but think it would look really good with a pleated skirt too. I wore it on the school run the other day and Sam asked why I was wearing it and what it meant, so at least it’s a conversation starter! Finally, the slider shoes are so easy to wear and I love any animal print shoes. I have these in black already and they are such a great buy at £22. I haven’t seen a Primark on a retail park before so this was a bot of a novelty! I found it much quieter than the city centre ones and enjoyed having a look round. 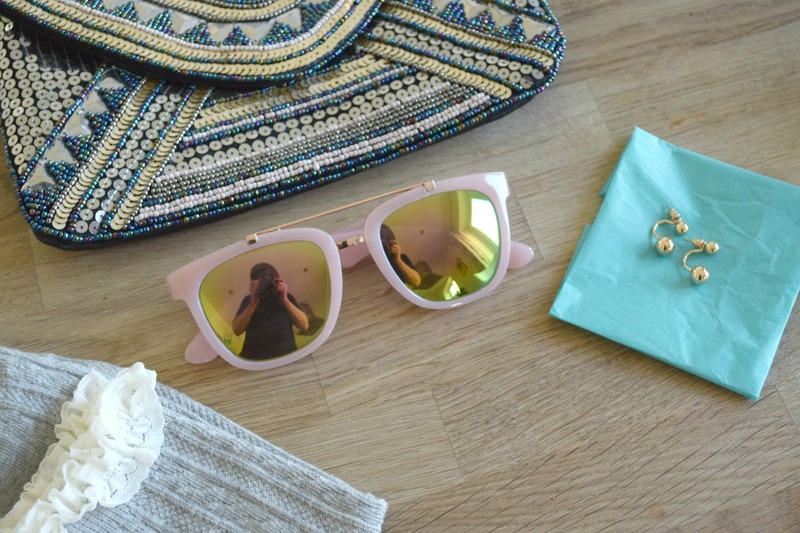 I ended up with some really cool accessories for only a £12 spend; a beaded bag for £7, some fun pink mirrored sunglasses for £3 and some frilly socks for £2, which sent me over the budget so may be returned! I haven’t included them in my haul for this reason. 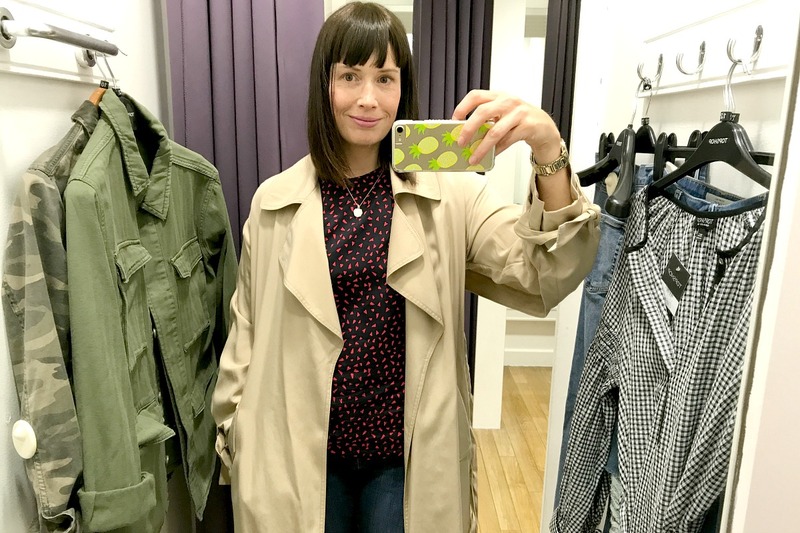 I love an Outfit shop – when I lived in Wirral it was my closest Topshop (addicted, me?!) and it’s really handy if you don’t want to go into your nearest city. 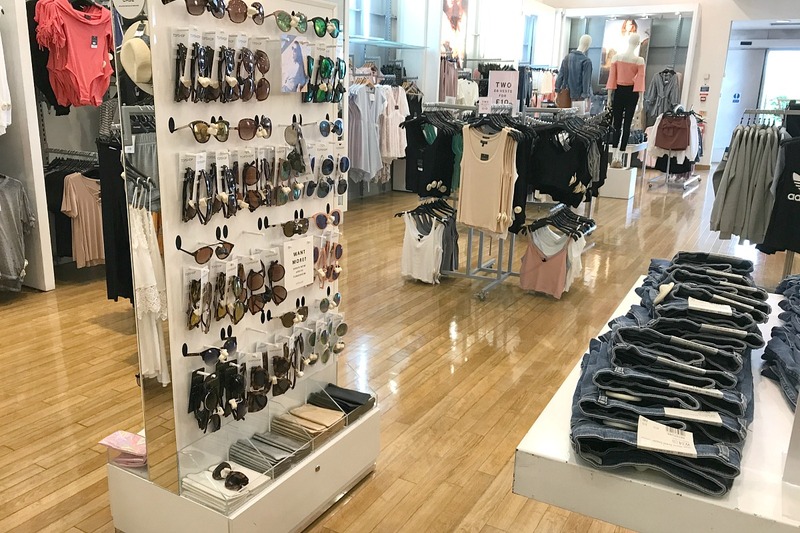 Outfit at Monks Cross doesn’t have a Topshop, probably as there is one a few doors down, but it does have several concessions such as Oasis, Warehouse, Miss Selfridge and Dorothy Perkins so it means you might pick up something from a brand you wouldn’t normally look at. I love all the tropical prints they have in Oasis at the moment and where I don’t think I’d wear the bright green printed skirts I did fall for this jumpsuit. 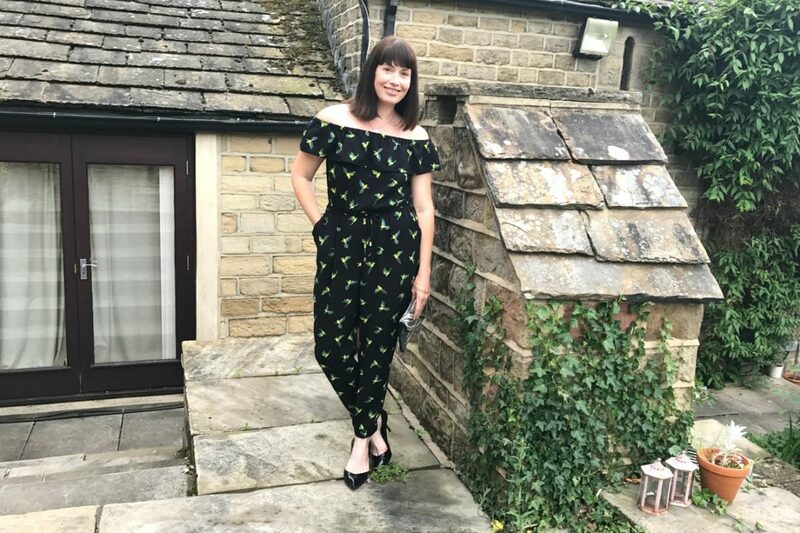 I haven’t tried on a jumpsuit since I was about 10 years old, but I loved them then so why wouldn’t I now?! I think I haven’t looked at them because I didn’t think they’d be very flattering or easy to wear but this one feels so simple and classic, and I love the off the shoulder Bardot look. It’s black with a bird design on (birds again, my late husband used to say I’d go for any clothing with a bird on) and I just really like it. 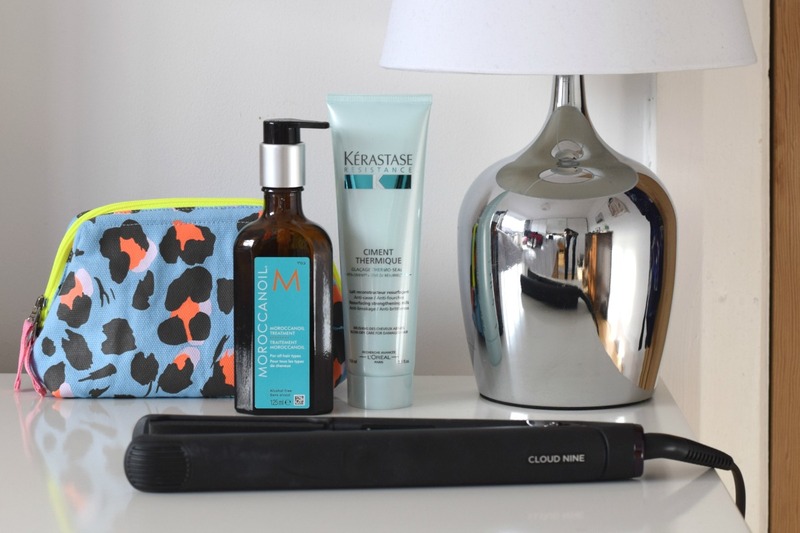 It’d be great to pack for a holiday or mini break, really lightweight and versatile. At £45 it’s not outrageously priced either. I bought some really soft grey skinny jeans in Oasis as well. I’ve tried them on before so knew they’d be a good fit and you can never have too many pairs of skinnies, can you? They were £40 and I’ve already worn them a few times since my shopping trip less than a week ago. Now let’s talk about the things I liked and the things I bought but sent me over budget! I looked in Monsoon and fell for this black embroidered cami top, which also comes in ivory which is equally lovely. It fits really well and would be a great summer buy but the only reason it didn’t make it into my style challenge was because I’d already blown the budget! I really loved a jacket in Monsoon too, which was a lightweight black cotton with bright embroidery on; lots of gingham tops in New Look; several handbags in Accessorise; jewellery in every single store I went in; lots of pairs of sandals in Clarks; and a pleated cotton skirt in Primark. They are all on my mind for my next shopping trip! 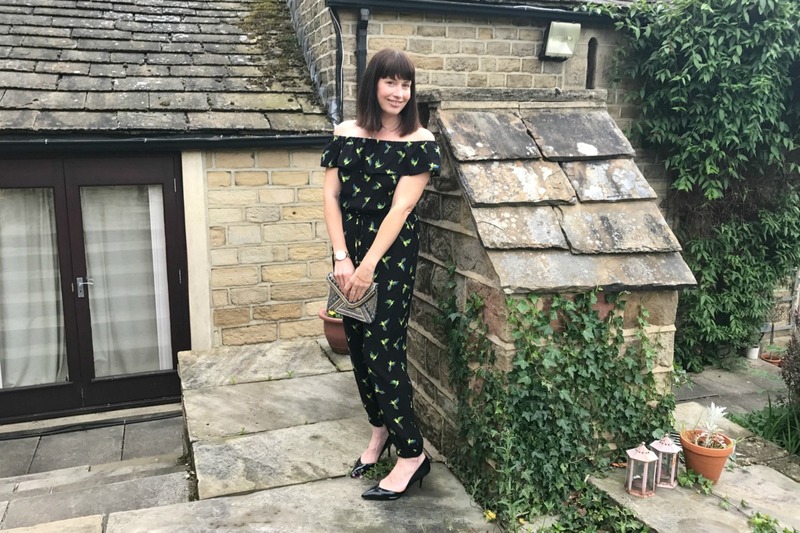 The handbag and shoes I’ve teamed with the jumpsuit in the graphic are just for styling ideas too, as my budget wouldn’t run to two bags and two pairs of shoes. The black shoes in the top photo are my own and are from Dune a few years ago. I really loved taking part in this style challenge and I hope you like some of the things I picked out. I’ll definitely be back to Monks Cross again, it’s so handy and a great meeting place I have worked out for myself and my friend Bridget! If you live nearby how do you fancy winning a £100 voucher to spend there? 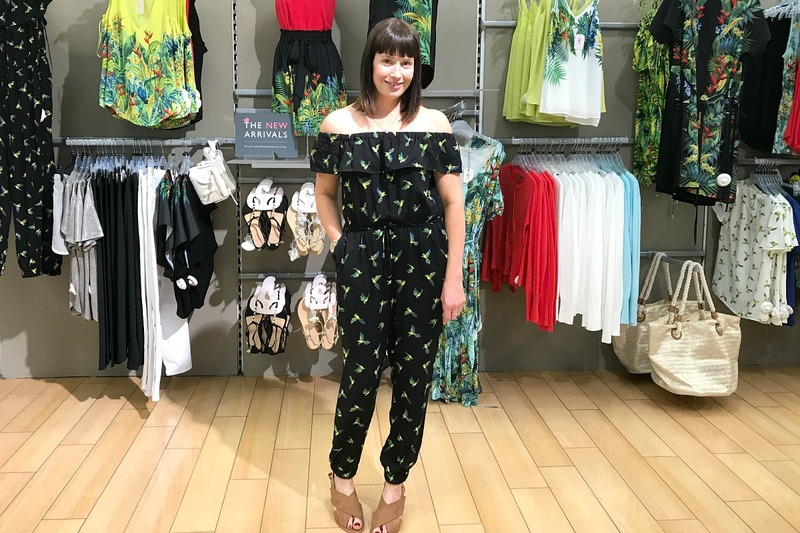 To mark my taking part in the #MonksCrossStyleHacks challenge, Monks Cross Shopping Park are giving you the chance to win £100 to spend on fashion in their stores. For the chance to win just enter using the Rafflecopter form below. Such an amazing prize, good luck! You can follow Monks Cross on Facebook and Twitter too. Open to UK entrants aged 18 and over. Prize is non refundable and non exchangeable. Prize will take the form of 1 x £100 or 2 x £50 gift cards for the Monks Cross stores of the winner’s choice. Love the jumpsuit! looks gorgeous! 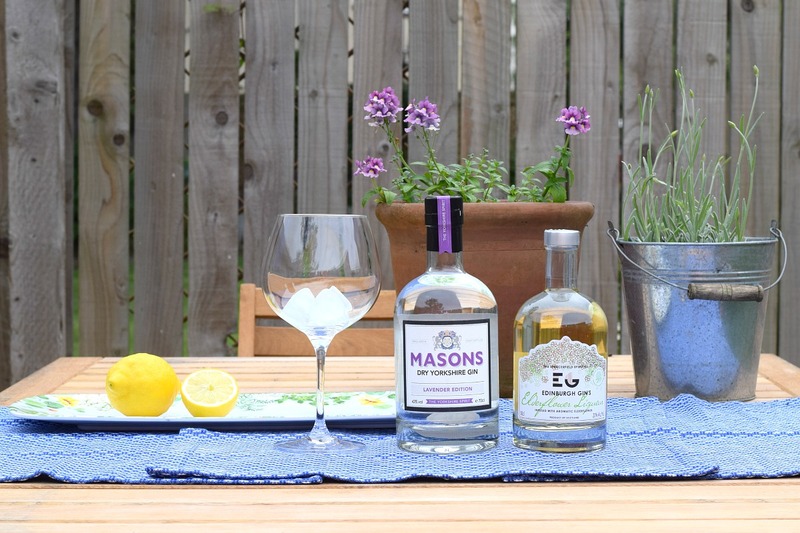 Fab blog, I must admit it’s been a while since I last popped to Monks Cross. I really enjoy nosing around Outfit, so many options in one place! And of course Primark is always good. Having Sainsburys and Asda there too is so handy for home wear and clothes. I agree the jumpsuit is fab. Love your choice of jumpsuits for night, it goes really well with your black high heels. I loves Monks Cross too!!! super fan, I would say. I went there every Sunday spend my day there, as a treat for myself. I drop my child at Explore learning in Sainsbury’s. While he working hard on his school work, that’s my favourite time shopping around Primark, Boots,M&S, Clarks, New Look, Topshop, Sport Direct, WHSmith. Then have a coffee break at Costa or Starbucks. Pick my child up, then go to Pizza Hut for my dinner. After dinner a bit of play in the little park to spend some more energy or goes to Game shop look for a reward for him if he does well on his school work. So actually, we could spend hours at Monks Cross, and as you said it’s free parking. Here, No need to worry about the parking fees or looking at what time go back for my car. Parking fee are so expensive in city centre. I can spend time here as long as I like. I’ve never been to Monk’s Cross but I love your New Looks finds! All gorgeous outfit choices! I love New Look for the wide selection of styles they always stock. Wow Julia, this would be my most favourite day ever! 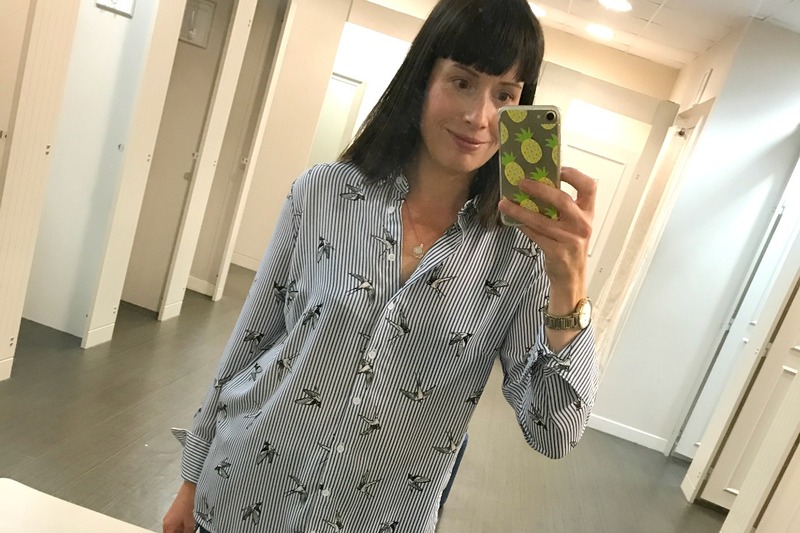 I really love that bird shirt from New Look on you and I tried on that gorgeous jumpsuit which look terrible on me but looks gorgeous on you! What a day eh? Can you tell I LOVE shopping? !